There is a part of me that will always identify itself with Harley Quinn having studied and cosplayed the character for two years now. For many cosplayers, Harley has helped us to understand and interact with the manic world around us. To understand exactly how, we should consider the values associated with her character because in cosplaying Harley Quinn we interact with a much wider set of values which hold greater historical significance than we might first think. Harley Quinn in Batman: The Animated Series. USA: DC Entertainment and Warner Bros. The Harlequin is a stock character which comes from the 16th century commedia dell’ arte – an Italian theatrical form known for its comedic action and parodic styles, often merging retellings of classical literature and improvised set pieces. Harlequin was known for being an eccentric servant and he was clever and witty, though unlike other servants in the commedia dell’ arte was loyal to his master and would not hold grudges against being wronged by them. Harley Quinn on the other hand is the clown princess of crime. Created by Bruce Timm and Paul Dini for Batman the Animated Series (Kane, 1992-95) she is a staple part of DC’s Batman universe. The character’s popularity has since boomed with Harley appearing in a whole array of comics, games, television and films. Harley Quinn is in many ways the Harlequin’s successor. She is the sidekick to one of Batman’s greatest foes, the Joker. Like Harlequin, Harley is eccentric and funny, a master of slapstick and buffoonery. Perhaps most notably, Harley is also a ‘serving character’ and just as the Harlequin is loyal, Harley is similarly madly in love with her boss the Joker, despite the abuse and backstabbing that he regularly throws at her. The iconic costume of the Harlequin embodies these characteristics, as we can see in Cézanne’s ‘Harlequin’ (1888-90). The design of his suit is often associated with bright colours, in this case bright red against black, a dynamic which is typically playful for the character. Yet simultaneously the costume’s tight fit is non-extravagant in comparison to other stock characters such as the Dottore, or the Pantalone, which marks the character’s lower serving status. The similarities between Harlequin’s costume and Harley Quinn’s costume are very distinct. Both are in a black and red tight-fitting body-suit, with diamonds an integral element of the design. Harley’s hood quite distinctly replicates that of Harlequin’s bicorn hat and both have a flamboyant ruff around their necks. Further to this Harlequin’s prop of the wooden sword is also seen replicated in Harley Quinn’s iconic mallet. Both characters’ costumes are steeped in the carnivalesque. Their clothing is clown-like and emphasises their playful and witty characteristics. Harlequin’s wooden sword is a toy which further invokes this playfulness; similarly, Harley’s mallet is similar to that of a “Test your Strength” mallet you’d get from a side-show. The costumes of both characters bring a sense of the unreal into the real world, their madness and buffoonery a fun distraction from the routines of the real world. Stein, C. 1976. ‘Debbie Harry Photo Shoot in Vulture Tee’. via Havoc. Part of Harley Quinn’s resilience is just how much she has been reinterpreted within the DC universe as her designs and situations within the DC universe are being constantly re-invented, yet still she ultimately remains grounded in carnival origins. Harley Quinn’s costume in Suicide Squad, howeve, seems to have more in common with that of Debbie Harry (pictured) rather than that of the Harlequin. Suicide Harley is practically identical to Debbie Harry in her “vulture” photoshoot with the clothing and rebellious attitude matching. However, rather than distinguishing Suicide Harley from her carnivalesque origins what we might suggest here is the ways in which punk upholds similar values of Harlequin and of the carnivalesque. Like the Harlequin, punk can be seen as a protest against the social confines of being oppressed by ruling figures, as an expression of ones love of life and the desire to express oneself. There is therefore a shared sense of subjugation and rebellion between the Harlequin and Suicide Harley. 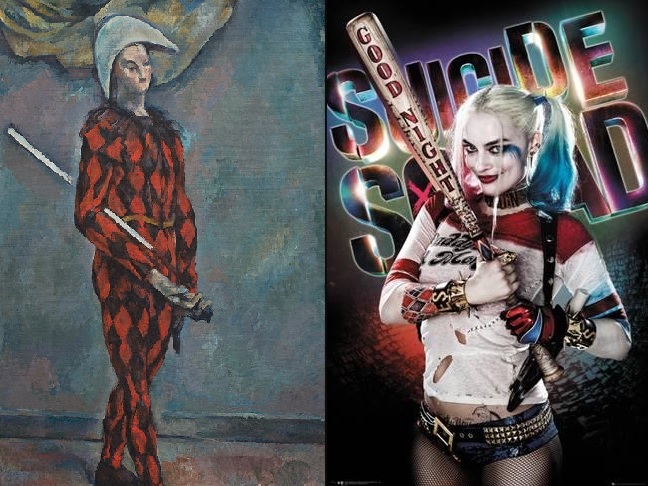 Further to this, in this punk aesthetic Suicide Harley does still share distinct similarities with the Harlequin in the use of bright colours, the Harlequin diamond motif, her pigtails mimicing the bicorn hat and her baseball bat that seems to be a direct reference to the Harlequin’s wooden sword. We might also suggest that the punk ripped clothing of both Suicide Harley and Debbie Harry hark to the earlier costumes of the Harlequin. There’s much to suggest that the full tight suit was a later 18th century development in the Harlequin’s costume. The earlier costume, however, was that of typical servant’s clothes, with colourful stitching and patches. This earlier version of the Harlequin can perhaps be more closely compared with Suicide Harley as the home-made quality of her t-shirt seems to replicate in the running colours and tears in the fabric. These carnivalesque values can thus still be seen as important in today’s culture. An indicator of this is that not only is Harley Quinn a staple character at cosplay conventions by cosplayers of all identities but, ‘Morphcostumes’ and ‘Google Fight Fest’ found that in 2016, Harley Quinn was the most requested Halloween costume in both the USA and the UK. In 2017, Harley Quinn was still in high demand in 2nd place (after Wonder Woman). The appeal of cosplaying Harley Quinn from the perspective of many cosplayers is to share her buffoonery and to relieve oneself from the everyday stresses of the real world. Harley Quinn and fan conventions then are the successors to the Harlequin and the 16th century carnival. In cosplaying Harley Quinn, we take upon a role with a long history of rebellion and play, which thus allows us to escape and have a precious bit of fun. Daniel Skentelbery is a postgraduate student at Keele University specialising in children’s media, fan studies, gender theory, feminist theory and cosplay studies. 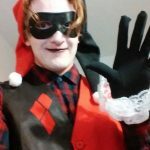 He has published the paper ‘Wonder (Wo)Man: Examining Gendered Identities and Gender Bending Through [the art of] Cosplay’ for peer-review journal Under Construction, and received the Laura Mulvey Prize for the best dissertation (Keele University, 2017) on ‘Cosplay: Harley Quinn and the Subversion of Gender Norms’. Want to submit your own costume story?